The pop-up play area is part of an "Urban Forest" initiative organized by Tata Inti, a local non-profit founded in 2014 that provides education to children under 6 in Barcelona. 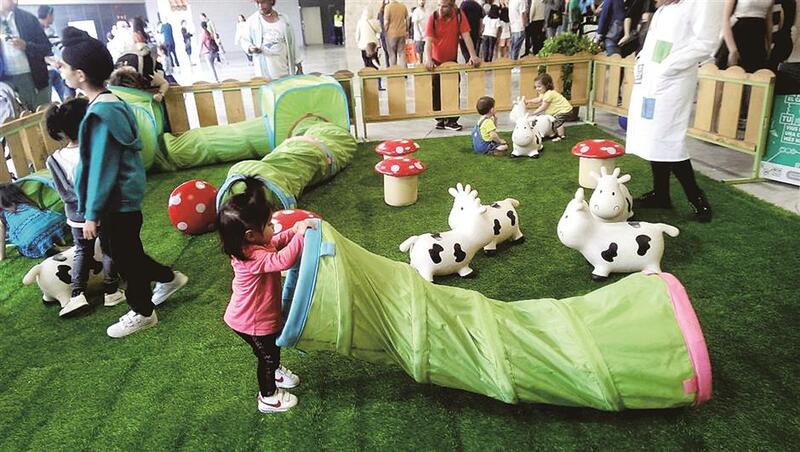 In a part of Barcelona best known as a concrete transport hub, just a stone’s throw from the bustling Sants railway station, a square has been transformed into an idyllic play area. Sitting on a sea of bright cushions and rugs, under canopies shading them from the sun, children tinker with nature-inspired toys, including bits of wood in all shapes and sizes, as their parents look on. The pop-up play area is part of an “Urban Forest” initiative organized by Tata Inti, a local non-profit founded in 2014 that provides education to children under 6. Children and their parents take part in the “Urban Forest” initiative run by local non-profit organisation Tata Inti in the Sants district of Barcelona. The government-funded organization aims to “democratize the care of young children, make it visible and at the same time recover public space as a meeting place,” said Merce Aranda, co-founder of Tata Inti. The Urban Forest project, which will hold sessions in eight areas of Barcelona over the next few months, offers free play to lower-income families, Aranda said. 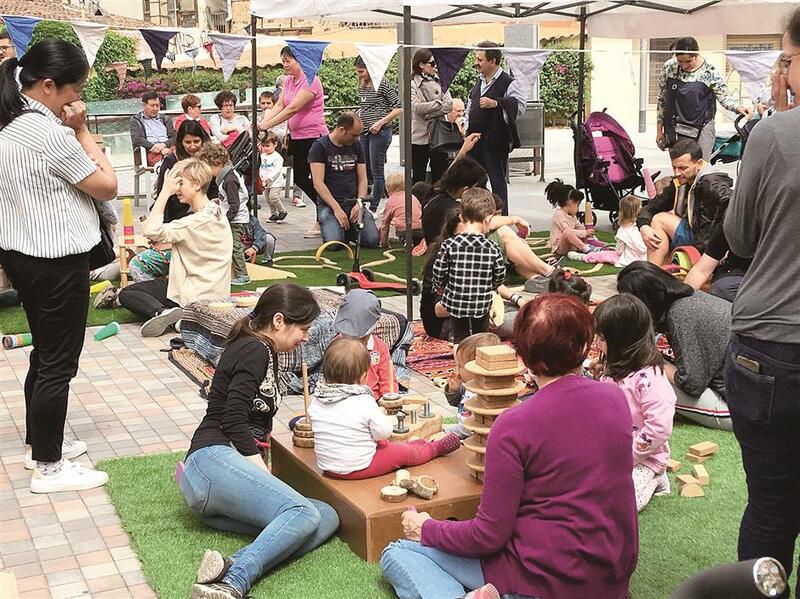 It comes at a time when city authorities are pushing forward with a 20.7 million-euro (US$23.9 million) initiative, started in 2015, to make Barcelona a more child-friendly city. Of the 4 billion people living in the world’s urban areas, nearly a third are children, according to UNICEF. By 2050, 70 percent of the world’s children will live in urban areas, it estimates. Healthy development of children is crucial to the wellbeing of any society, and the costs of failing are huge, as early experiences shape their future achievements, according to UNICEF, which runs the global Child Friendly Cities Initiative. Weaker social cohesion and higher crime rates in dense urban areas increase psychotic symptoms in children, including hearing or seeing things that others do not, found a 2016 study published by US-based Duke University. Independent mobility — when a child can move around a city without being accompanied by an adult — depends on road crossings, perceptions of safety, and the proximity and availability of things to do, global engineering firm Arup said in a report this year on design for urban childhoods. 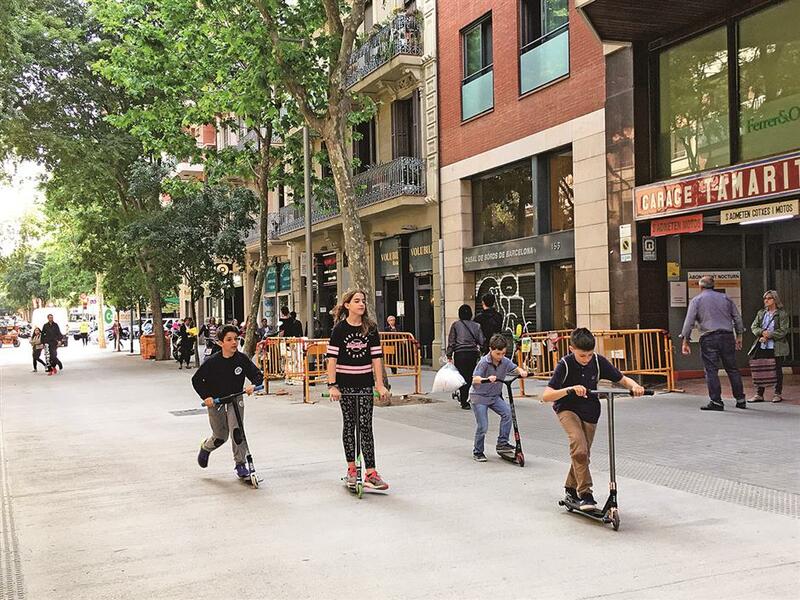 Children ride scooters through a newly opened “superblock” area, where traffic flow is restricted, in the Sant Antoni district of Barcelona, Spain. Cities that can offer children a network of routes and activities that they enjoy using and are good for them means thinking beyond fenced-off playgrounds, said Tim Gill, a UK-based researcher and author who has advised London’s mayor on child-friendly city planning. Children will play in many different types of spaces, he noted. “So let’s think more creatively about how we can design public spaces where play is a function ... but may not be the only function,” he said. Cities designed with children in mind would have less traffic and more suitable infrastructure such as wider pavements, multi-functional play spaces and new models like Barcelona’s “superblock” system which restricts traffic flow in selected neighborhoods, Arup said. Some cities have also begun incorporating wild spaces or freestyle playgrounds, where children can play in nature rather than a man-made setting. Critics say playground design since the 1970s has become too focused on health and safety, leading to unimaginative facilities that stifle children’s creativity. Unstructured outdoor play can improve children’s problem-solving skills, focus and self-discipline and boost their ability to get along with others, leading to healthier and happier lives, experts say. British children play outside half as much as their parents did and the developing world is starting to experience the same trend. “As you are seeing a growing middle-class in poorer countries, you are also seeing children’ lives becoming more constrained, and more fear about children’s freedoms,” he said. Giving children simple liberties, rather than rearing them “in captivity” is good for them, but also for society more broadly, said Gill, adding enabling children from different social classes and ethnic backgrounds to spend regular time together also reduces community tensions.